I must confess that I bought a few King James 400th commemorative Bibles (although, much to my annoyance, the version that I really want to read is still not available for purchase). 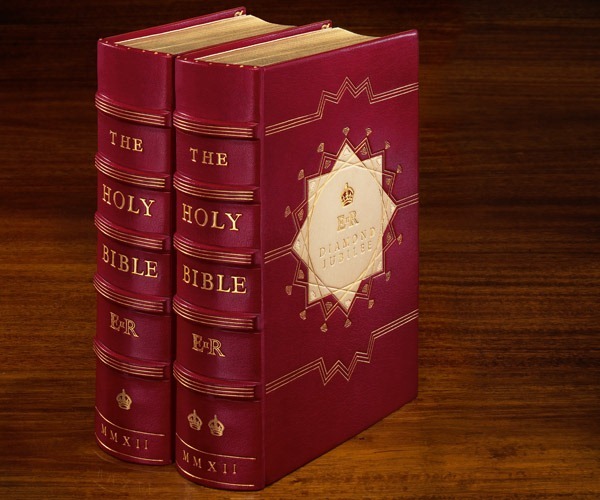 But forget that – now the excitement is on for Elizabeth II commemorative Bibles. At her coronation, Queen Elizabeth II took her oath on a Bible created especially for the ceremony. The commission fell to the illustrious bookbinder, Sangorski & Sutcliffe, which – 60 years on – remains at the pinnacle of fine bookbinding. The Folio Society is delighted to present a new edition by Sangorski & Sutcliffe: the Diamond Jubilee Bible. 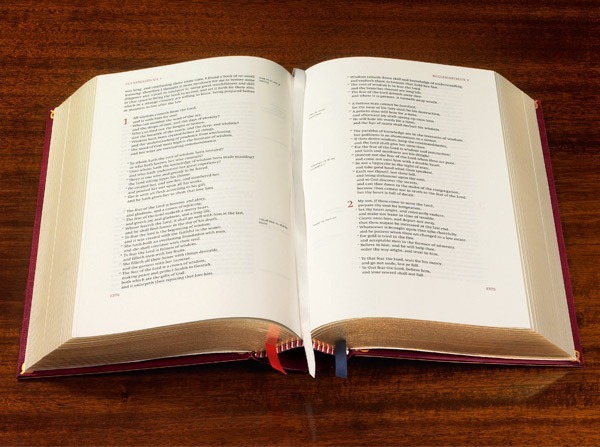 Inspired by the design of the Coronation Bible, it is hand-bound and limited to 60 numbered copies. The Folio Society was approached by Robert Shepherd, the owner of Sangorski & Sutcliffe, about the creation of this commemorative Bible. The book would be produced to exacting standards, using all the skills, and indeed the tools, employed for the Coronation Bible. There would be hand-sewn sheets, and silk head- and tailbands. The binding would be in the finest vegetable tanned goatskin, hand-tooled with gold leaf. Asked for his thoughts on a suitable edition of the Bible to be bound in this way, The Folio Society’s Production Director Joe Whitlock Blundell showed Robert a copy of our limited edition of the King James Bible, of which we still held some unbound sheets. He agreed that they would be ideal for the purpose. Thanks to this involvement, Folio Society members are among the very few people invited to secure a copy of this exquisite and rare edition. The Coronation Bible came from a limitation of 26, two of which were bound specifically for the Queen. The first was used in the coronation ceremony and is housed in Lambeth Palace; the second was presented to the Queen by the publisher, Oxford University Press. The remaining copies were given to leading dignitaries who attended the coronation. None were sold, but a very few did find their way onto the open market and have become highly prized by collectors. Francis Sangorski and George Sutcliffe met as apprentices at the Central School of Arts and Crafts in London in 1896. The two men were employed by their tutor, Douglas Cockerell, before setting up their own business in 1901. In the years that followed, Sangorski & Sutcliffe became renowned for jewelled bindings, among the more famous of which were an illuminated manuscript of Romeo and Juliet and an elaborate copy of The Rubáiyát of Omar Khayyám that sank with the Titanic. For the design of the Coronation Bible, Sangorski & Sutcliffe employed the distinguished artist Lynton Lamb. He too had studied under Cockerell, whose influence can be seen in Lamb’s design for the Bible. He wrote in 1953, ‘if one has taken a great deal of care over sewing the sheets to the cords, rounding the back, and making the boards true, one does not want to break down these effects by a contrary scheme of decoration’. The design he created works in perfect harmony with the spine structure, the raised bands of the spine leading to gold-tooled music staves. Using some 32 distinct skills, Sangorski & Sutcliffe hand-bound the Bible in red levant goatskin and created a cream inlay tooled in gold and black. 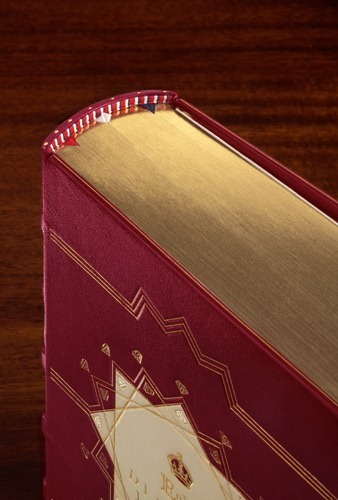 For the Diamond Jubilee Bible, produced with the approval of the Lord Chamberlain’s Office, Sangorski & Sutcliffe is following the same principles of hand-binding and sound structure. The tools used 60 years ago are being employed to create the lettering and Royal Insignia. This Bible is in two volumes, with bindings inspired by Lamb’s original design. Here, the central lozenge has been repeated and rotated to create a diamond at the centre of the front and back boards, tooled in gold leaf with onlays of fair calf leather. Surrounding each diamond are 30 smaller, conical diamonds, cut by the binder’s gold finisher using a tool specially created for this edition. As a final touch, each volume is enclosed in an elegant leather-trimmed slipcase. The result is an edition both imposing and graceful – a fitting celebration of a rare and momentous occasion. Only 60 copies will be printed, each one numbered by hand on a special limitation page. The bad news? 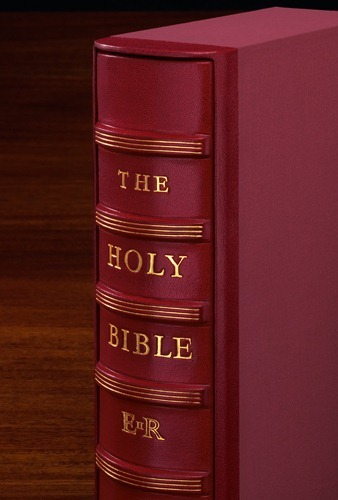 This Bible may set you back a little – it is priced at $7,995 (or £5,000.00). (Thank goodness it is not $8,000.) I’m afraid that is outside my price range, but I hope to see a review on Mark Bertrand’s blog. On the other hand – if you actually want to buy a KJV to read, rather than to collect I can recommend the Penguin version of the New Cambridge Paragraph Bible (or for the original translator notes, the New Cambridge Paragraph hardcover). And, maybe, who knows, someday the Norton Critical Edition may actually appear. PS: I wish Elizabeth a long and healthy life. But I also hope that she is the last monarch of Britain – and that Britain can someday soon become a republic. On a related note, I received just now an e-mail from a British bookseller, “The Book Depository” recommending a list of books for Elizabeth II’s Jubilee celebration. The first book on the list? Join your favourite slightly bossy little pig, as Peppa meets the Queen. This is a perfect storybook to share with your little piggies at home in celebration of the Queen’s Diamond Jubilee. A sweet and hilariously funny tale about learning to love yourself. It’s not so easy to keep a stiff upper lip when one has a wobbly bottom! The Queen is beautiful, clever and popular, but all she can think of is her bottom. It wobbles like a raspberry jelly, and the queen doesn’t like it. When she offers a reward for a solution to the royal wobble, hopeful candidates turn up in droves with cures of every kind. But none of them work, and the queen eventually discovers that real beauty comes from within. 2012 marks the Diamond Jubilee of Queen Elizabeth II, and what better way to celebrate than by dressing her and members of the Royal Family in an array of right royal outfits? This fun paper doll book features a range of clothing options so that you can help Her Majesty look her regal best for this very special year. Also included are dress-up dolls of some of Ma’am’s nearest and dearest, from Prince Philip to those lovable little corgis. Glad to see that at least one major British bookseller has the right perspective on this. 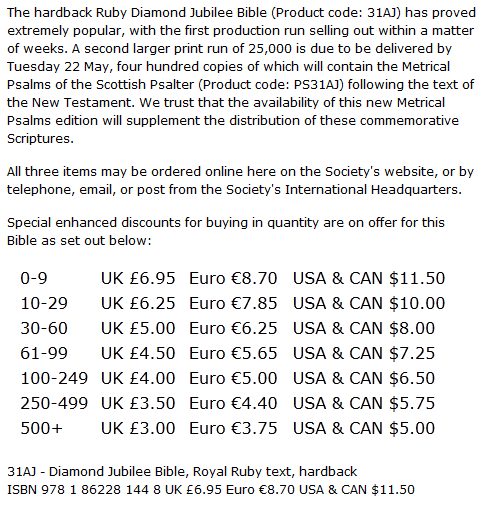 I how can I order a copy of the KJV of the Diamond Jubilee Bible? James, I am assuming you would like to order the cheaper TBS Jubilee Bibles. Currently, there are two for sale: one for $11.50 and one for $80.00.